Game On! Sports Camps 4 Girls - Get Involved. Make Friends. Enjoy Motherhood. Since 2007, Game On! 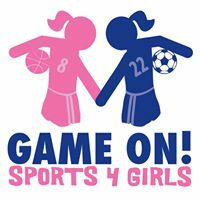 Sports 4 girls has been dedicated to impacting the lives of girls of all skill levels, ages 5-14, and harnessing the power of sports to build confident, strong girls who grow into the valued teammates and high achievers of tomorrow. MULTI-SPORT SUMMER DAY CAMP: Campers play multiple sports daily, which can include lacrosse, softball, volleyball, basketball, tennis, field hockey, soccer and swimming. We also partner with respected local organizations to expose girls to martial arts, touch/flag rugby, yoga, horseback riding, golf, climbing, speed/agility, and so much more. Through our Healthier4Me program, we focus on important topics such as respect, perseverance, giving back, peer pressure, body image, self esteem, etc. Anc our high quality staff is comprised of highly qualified athletes and teachers who bring skills and a joy of coaching to camp. Our 2019 camp will be hosted at Douglass Elementary School in Boulder, Colorado from June 3rd to July 19th. Additional options include flexible weeks, half day for 5 year old campers, and before/after camp care. OTHER PROGRAMMING: While we love summer, Game On! stays involved throughout the school year through our signature after school programming, day off school events, sport clinics, Girl Scout troop activities (free as a part of our community service volunteer efforts), birthday parties, creative projects, and more! MOD Moms receive a 10% discount off total summer camp registration. To receive this discount code, please contact Maria at maria@gameonsports4girls.com or call (720) 893-2386. Verification of MOD Moms current membership is required.